Figure 6.2 “Are we Afraid? NO!” A 1915 cartoon captures the spirit of the Imperial war and the Canadian Imperialists’ view of the larger world. Insofar as there is any truth to the old line that generals are always ready to fight the last war, the Boer War had a disastrous influence on Canada — as well as on Britain. The idea that a 20th century campaign in Europe could be conducted with cavalry, with glory, and with few casualties was to prove a nonsense. The martial spirit that was inspired by the adventures of Sam Steele and his peers in 1899-1900 paired up with 19th century enthusiasms for muscular Christianity to produce a decade of jingoism. These passions had social consequences. Fears of racial degeneration and the weakening of industrial workers by poor conditions and suboptimal diets created room for a perceived crisis in national readiness. It is no coincidence that this was the era that produced the Boy Scout (or Scouting) movement under the leadership of a British officer and veteran of the South Africa campaigns, Robert Baden-Powell. Self-discipline, child discipline, and military-like organization became more widely valued and promoted across Canadian society, even in Quebec, where cadet training enjoyed particular popularity. There was resistance to these attitudes — the Industrial Workers of the World (see Section 3.6) declared paramilitary organizations, including the Boy Scouts, anathema. And the persistent division between francophones and anglophones over the issues of imperialism and nationalism (see Section 4.5) had the potential to turn further international conflicts into a national disaster. Beginning in 1870 at Red River, through the North-West Rebellion and the Boer War, taking up arms meant straining the very fabric of the Canadian project. What was to come in 1914 would test it further still. Economic and imperial tensions between Germany and its chief competitors — France and Britain — produced a spider’s web of alliances and promises that entwined almost every nation in Europe and a few in Asia as well. The Triple Alliance (Germany, the Austro-Hungarian Empire, and Italy) was balanced off by the Triple Entente (France, Britain, and Russia). An attack against one member would result in the other partners defending its interests. There were also secondary alliances, such as Britain’s with Belgium. So long as fear of the balance of power was greater than enthusiasm for war, peace would hold. In the meantime, it was easy to imagine someone making a misstep. This happened on 28 June 1914 when the Austrian Archduke, Franz Ferdinand, was assassinated by a Serbian nationalist, Gavrilo Princip. A bubbling crisis in the Balkans (coveted by Austria, protected by Russia) erupted, and by 4 August all the major powers in Europe were at war. The bullet that Princip put into the Archduke, however, was only a proximate cause. There were many others involved and historians continue to debate which were most important. 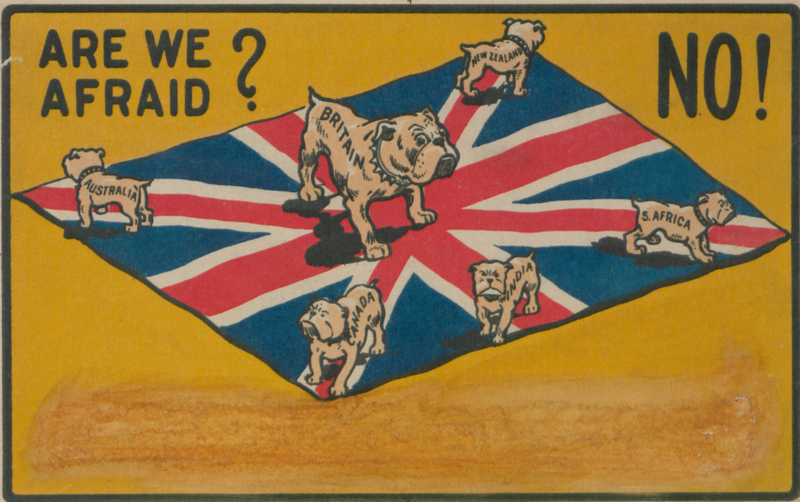 For Canada in the summer of 1914, only one catalyst existed: Britain was at war, so Canada was as well. A great many Canadians were thrilled. The build up to the war had been ongoing for nearly two decades and marginal wars had been fought around the colonial edges of Africa and Asia. A continental war would settle the issue of imperial dominance once and for all and would put paid to further colonial sideshows. What is more, the economy in Canada had started to sour in 1912 and war was reckoned to be good for business. While Nationalists in Quebec might decry Canada’s involvement, constitutionally there was no question that Britain’s decision to go to war made the choice for the Dominion as well. Figure 6.3 It’s all a great adventure until you get to the trenches. 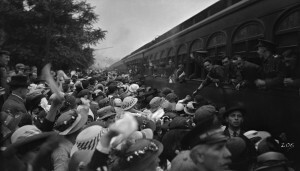 Enthusiastic crowds turn out to see troops depart Hamilton in 1914. Few likely suspected that this was going to be a war of attrition and not glory. Was Canada ready? The Naval Services Act that brought Laurier’s defeat in 1911 was scrapped after the election, and any plans for a Canadian Navy went with it. Worse, Borden’s effort to secure $35 million to pay for the construction of three dreadnought-class warships was blocked in the Senate. Now Canada had neither a Navy nor could it reasonably claim to have contributed to building up Britain’s. The militia was in better shape. In 1898 it had a budget of only $1.6 million, a budget that, under Laurier, increased to $7 million. Then, on the eve of war, Borden raised it to $11 million. There were slightly more than 74,000 men in the various regiments but only 3,110 in the permanent force. This was still an amateur’s army, not a professional standing army, but the Canadian offer to Britain of 25,000 men under arms was regarded as a bold demonstration of imperial loyalty. Borden’s administration took the exceptional step of introducing the War Measures Act, 1914, which extended wide-reaching powers to the federal government for the duration of the war. These included the ability to suspend civil rights and thus enabled the arbitrary internment of “enemy aliens.” It was not, however, meant to extend the life of the government, although Borden would use the circumstances of war to avoid going back to the polls in 1916. The war, of course, did not play out according to the bombastic script provided by Imperialists. A few quick advances in 1914 were followed by stalemates along Germany’s western and eastern frontiers. The German attempt to outflank French troops by marching through Belgium brought British forces into play in northwestern Europe. By the spring of 1915, German forces were quite literally entrenched. The Canadian Expeditionary Force (CEF) arrived just in time — in March 1915 — to see the beginnings of an unprecedented war of attrition. A month later, the Germans deployed chemical weapons for the first time and Canadians were among the regiments hit hardest at Ypres. From that moment until the end of the war, the Western Front moved one way and then the other, but without any real result other than massive mortalities. The conditions that led to the bloodbath that was the Western Front, were many. 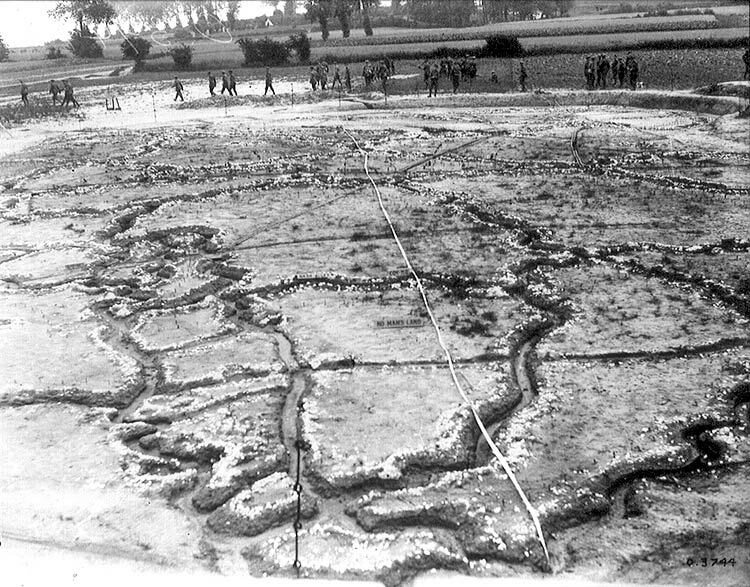 The terrain was impenetrable: irrigation and drainage dykes in the Low Countries gave away under shelling, burst their banks, and turned the farm fields to gumbo. Canadian equipment — particularly the Ross Rifle — was inadequate and came in for a great deal of criticism. An innovation that made ranching possible across the Canadian Prairies — barbed wire — was now deployed against Canadian farm boys (and they used it as well against the enemy). Cavalry charges were, of course, out of the question but aerial bombardment wasn’t. The American Wright Brothers were quick to weaponize and market their flying invention to each European state and both sides of the war now had to face machine guns on the ground and in the air. The Germans, stretched to their limit on two fronts, relied on technology to make up the difference: hence their decision to use banned chemical gasses as early as 1915. Chance made matters worse. The weather didn’t cooperate: it was an outstandingly wet, cold, and miserable couple of years. 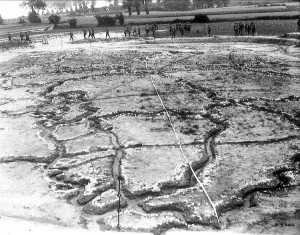 The trenches in which the Entente forces found themselves pinned were saturated with rain and field water; muddy collapses and horrible deaths were inevitable. Although ceasefires allowed for some casualties and mortalities to be recovered, shelling reduced many soldiers to ground meat. Latrine facilities were severely wanting; hygiene was dreadful and infection was rampant. “Trenchfoot” plagued soldiers whose boots were far from waterproof. Well-fed rats of legendary size terrorized the troops. Mental health was not a consideration at the time and attempts to run away — to desert — were typically met with a firing squad. This was grisly stuff and it would produce a great many physically and psychologically maimed veterans. 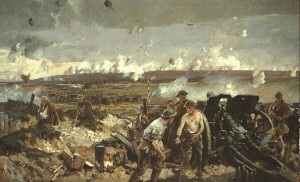 Figure 6.4 “The Battle of Vimy Ridge” was painted by the Canadian war artist, Richard Jack (1866-1952). Although, for the first time, motion pictures brought combat to screens, oils on large canvases were still a compelling vision of the first total war. Byng’s earlier experiences were valuable here and his tactics did much to shape this important chapter in Canadian military history. Byng brought together — for the first time — the four Canadian divisions. Nearly 100,000 Canadians were involved in the campaign, aided by British artillery units. A year of planning, punctuated with vicious trench-raids, produced an assault that began on the 9th of April 1917 and was complete on the 12th. The Canadians had accomplished what the French and the British could not. To be fair, the Canadians would not have overcome the German obstacles without the hard-won intelligence gathered by the earlier assaults. But the battle resonated at the time as a Canadian victory and the adage began to circulate soon thereafter that Canada went up the ridge a colony and came down a nation. In August 1918, Canadian troops were once again involved in a major push, but the course of the war was already decided. The Americans entered the fray as the Canadians were taking Vimy; by the time the Entente turned its guns on German positions east of Amiens, there were half a million fresh American troops in the field. Demoralized, exhausted, and fooled into thinking an attack was not coming, the German troops were overrun by a tightly organized Canadian attack that was part of another, larger venture involving at least four nations. The effect was to crack German resolve, which ultimately led to the Armistice of 11 November 1918, after which treaty negotiations got underway. The impact of peace and the Treaty of Versailles on Germany goes beyond the purview of this narrative but it is important to note that it embittered a great many and set the stage for political and social unrest that sharpened an appetite for further war a generation later. The expectation on the eve of the Great War was that it would be brief and that Canada would enter on the side of Britain without debate. Some Canadians welcomed the outbreak of war insofar as it might stimulate the economy and reduce the likelihood of further colonial wars. Most politicians and many military leaders badly misunderstood the kind of war with which they were faced. As a result, mortality rates were shockingly high. Canadian victories at Vimy Ridge and Amiens contributed to the growth of national self-confidence and a post-Imperial identity. Are we Afraid? NO! (cartoon) (HS85-10-29954) by the British Library is in the public domain. Off to the front, World War I (WWI) soldiers leaving Hamilton, Ont. from Grand Trunk Railway (G.T.R.). Stuart St. Station (Online MIKAN no. 3277194) by Andrew Merrilees / Library and Archives Canada is in the public domain. The Battle of Vimy Ridge (Online MIKAN no.2837452) by Richard Jack / Library and Archives Canada is in the public domain. Model reproduction of German lines N.W. of Lens (Online MIKAN no.3397952) by Canada. Dept. of National Defence / Library and Archives Canada is in the public domain. 6.3 The Great War by John Douglas Belshaw is licensed under a Creative Commons Attribution 4.0 International License, except where otherwise noted.